Austrian jurist; born at Prague, Bohemia, March 31, 1865. He is the son of Moritz Adler, author of "Der Krieg, die Congressideen, und die Allgemeine Wehrpflicht" (1868). Karl Adler studied at the universities of Prague and Vienna, was professor extraordinary of commercial law in the University of Vienna from 1893 to 1898, and in 1900 was professor of civil law at the University of Czernowitz, Bukowina. In 1898 he embraced Catholicism. Adler is the author of "Das Oesterreichische Lagerhausrecht" (1892), a treatise on the Austrian law concerning the regulation of storehouses; "Realcontract und Vorvertrag" (1892), a work dealing with contracts and first drafts; "Zur Entwicklungslehre und Dogmatik des Gesellschaftsrechts" (1895), an examination into the evolution and dogmatics of social law. 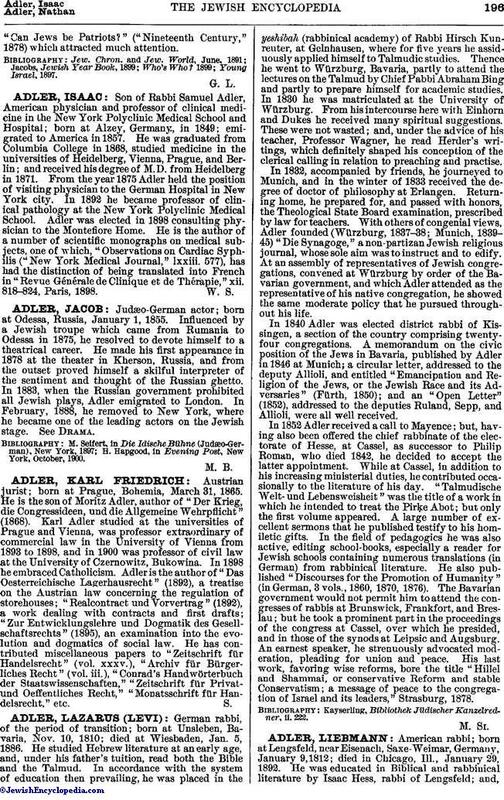 He has contributed miscellaneous papers to "Zeitschrift für Handelsrecht" (vol. xxxv. ), "Archiv für Bürgerliches Recht" (vol. iii. ), "Conrad's Handwörterbuch der Staatswissenschaften," "Zeitschrift für Privatund Oeffentliches Recht," "Monatsschrift für Handelsrecht," etc.